Which search engine optimization plugin is the better alternative for my blog? With more and more competing premium WordPress plugins it gets harder and harder to answer that question. This article takes a look at two popular WordPress SEO plugins: It compares WordPress SEO by Yoast with All in One SEO Pack in order to help you with your decision in choosing one. There are several other alternatives to WordPress SEO by Yoast and All in One SEO Pack on the market which I have compared in separate articles. Go to my main WordPress SEO Plugins comparison to start your search. Please note that this comparison only looks at the features on paper as reported by either plugin’s developers. It does not and can not tell you if or how well a certain feature will work for you. Because such a verdict would depend on too many variables, including your server setup and personal preference, I have decided to stick to the hard facts for this feature comparison between WordPress SEO by Yoast and All in One SEO Pack. In my comparison I track 28 different features for all the search engine optimization plugins. In WordPress SEO by Yoast you can find 24 out of 28 of those features. All in One SEO Pack on the other hand offers 15 out of the 28 features in total. Even if many of the features compared above overlap between the two competing products there is one very important difference: WordPress SEO by Yoast as well as All in One SEO Pack both provide a unique interface from which you will optimize your site and posts to rank better in search egines like Google. Since it is hard to rate the quality of such an interface objectively I recommend that you try both products yourself before deciding for one. WPscoop indexes the exact prixing plans of all compared plugins. Please refer to the table below for a quick overview of the prices of WordPress SEO by Yoast and All in One SEO Pack. To find the cheaper SEO plugin for your individual needs please go to my main comparison article. There you can search for the features you need and then see the exact price you would need to pay for WordPress SEO by Yoast or All in One SEO Pack (as well as other alternatives). You can have a look at the Youtube videos below to see WordPress SEO by Yoast and All in One SEO Pack in action. That will give you a better idea of how the interface looks and which of the two WordPress SEO plugins is easier to use. Most WordPress plugins have an option to test their service for free, either thrhough a basic free version, a trial period or online demo. Check if such an offer exists for WordPress SEO by Yoast and All in One SEO Pack and if so: Make use of it! By doing so you can compare both plugins directly and find out which one is the better alternative in you situation. But wait, there is more! Besides WordPress SEO by Yoast and All in One SEO Pack I have compared several other WordPress SEO plugins on WPscoop. I recommend you start your search for WordPress SEO by Yoast alternatives or All in One SEO Pack alternatives in the main comparison article. There you can filter all different products and search for the features you need. 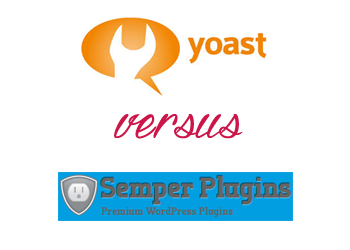 Which one is the better SEO plugin: WordPress SEO by Yoast or All in One SEO Pack? Please share your opinion or experience in the comments! I have used Yoast SEO plugin for my both websites. Very easy to implement. It is the best in the market. Right Now WordPress SEO is known as Yoast SEO. And according to me Yoast SEO is the best WordPress Plugin because this plugin provide more features like data importing from webmaster tool, breadcrump navigation etc. Many users use both of them plugin on their websites and blogs. Nice comparison. I have been reading mixed reviews about Yoast and All in One. I am currently on All in One and will try Yoast once just to check which one works better for my site. Nice comparison for two plugins. I used to use All in One Seo Pack, but now a week ago, I moved to SEO by Yoast. Personally I like SEO by Yoast. I think you might want to update the Price Comparison Table (I’m writing this 29/02/2016). The total price of All in One CEO is not $39 – this is only the “one off price”. You have to pay additional $49 per year for “recurring subscription for support and updates”. I.e. the first year including the purchase will be $88, then you pay $40 every year. Other options for the subscription: $10/month, $35/6 month. The purchase of Yoast includes 1 year subscription: $69 for a single site. So the first year (for a single site and also several sites) is cheaper with Yoast. Thanks Maria, the data in the article is older and so prices might have changed. I will look into updating the comparison soon. I like all in one SEO because the yoast free version has a lot of limitations. I use All in One in 1 site and Yoast in 2nd site. I see the second which is relatively new site has better visibility in google despite of lower pagerank. Is there any statistical research I can do between by sites to find which is better plugin. Please suggest me. I noticed that with Yoast it looks like there is no way to add a meta description for custom taxonomy archives even though it warns me that I need to add them. So I went to the support forum and see that the last update has been a disaster! I’m already locked into Yoast now since I’ve got custom code for the breadcrumbs and taxonomy descriptions. I’m wondering wether it is worth switching to All in One and re-writing this code in the light of the new Yoast update? I started using Yoast SEO plugin couple of months ago, and ever since then my post has disappear from Google search result page. The plugin’s sitemap is bad to the extent that both Google and Bing rejected it. I think All in one is better compare to Yoast. I have been suspecting exactly what you say for some time now, about Yoast and I have used this plugin – free – since 2011 with many websites of my own and those I have built. I have not used All in One SEO but I am certainly not going to use Yoast again, after today’s update by Yoast. I have also lost ranking with images as well and I don’t think the serps like Yoast for some reason, we don’t yet know but I think we are going to find out something soon. So I think we need to watch this space and I predict, from what I have seen, Yoast is on his way out unless he changes radically. Without a single doubt, WordPress SEO by Yoast is one of the best optimization plugins that have ever been produced. To rank highly in the search engines, an internet marketer using WordPress will need to configure it correctly and then find the most useful plugins that will aid him in that task. Although there are varieties to choose from, the WordPress SEO by Yoast is among the best that you will ever come across. I have now all in one plugin but i wonder if i use yoast plugin witch one is better! Many site use yoast but some site with good result also use all in one . I know a lot of people like Yoast’s plugin. But this one was around long before then. It’s been helping WP sites rank well for many years, and is still the best in my opinion. I’ve seen a number of side-by-side tests with Yoast’s plugin that prove All in One SEO is still the best and will help your site rank well, with the least effort. Great plugin. I use the Pro version on over 50 client’s sites. I completely agree with you. I find All in One to be far superior to Yoast in so many ways. Redirection is a better redirect plugin along with 404 to 301. I just tried giving Yoast a shot yesterday on a new client site that had it already and it failed to generate an XML sitemap. All in One’s didn’t. Never seen that before. I’m going off of free versions. Also I find many comparisons of the chart above to be completely misleading. It’s crazy how skewed reviews are towards Yoast. Vincent, what exactly do you find misleading about the chart in my comparison? Please note that both the Yoast and All In One team reviewed the data in the listing and were able to make corrections for any features I had missed, which were then added to the chart. It is not my intention at all to mislead or get people to use Yoast.